2. To make the pesto, combine all of the ingredients (except for the chicken) in a mini food processor and process until a paste is formed. 3.Place the chicken in a baking dish sprayed with cooking spray. Season the chicken, to taste, with salt, pepper, and garlic powder. Spread the pesto evenly over both sides of the chicken. Cook the chicken for 20-30 minutes or until cooked through. 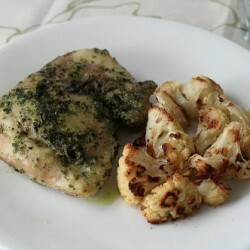 Roasted cauliflower:Toss florets of one head of cauliflower in 2 Tbsp of olive oil, pepper, and garlic powder. Spread evenly onto a cookie sheet. Bake the cauliflower at 400 F for 1 hour (turning every 20 minutes for even cooking). *Note carb counts are estimated based on the products used. Check nutrition labels for accurate carb counts.